Me: Hey, Kid 1, do you want to come and watch Deep Purple play Smoke on the Water? Kid 1: What does that even mean? Me: You know, the very first riff you ever learnt on your guitar? It’s a video of the band playing the actual song. Total silence from Kid 1. He didn’t even give me the courtesy of an answer. 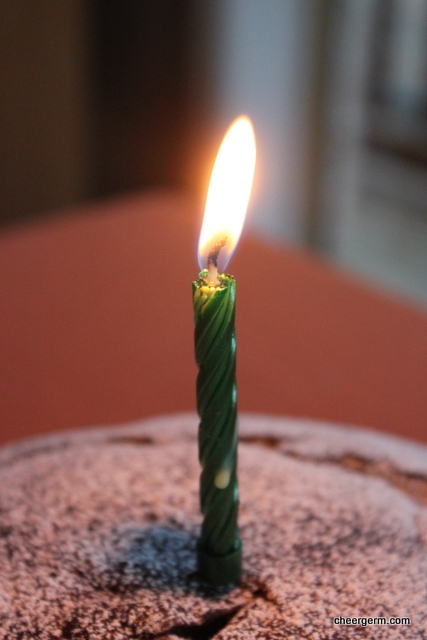 Speaking of age, WordPress kindly informed me the other day that this blog had turned one. My, it seems like only yesterday that I gave birth. How time flies when you are having fun. 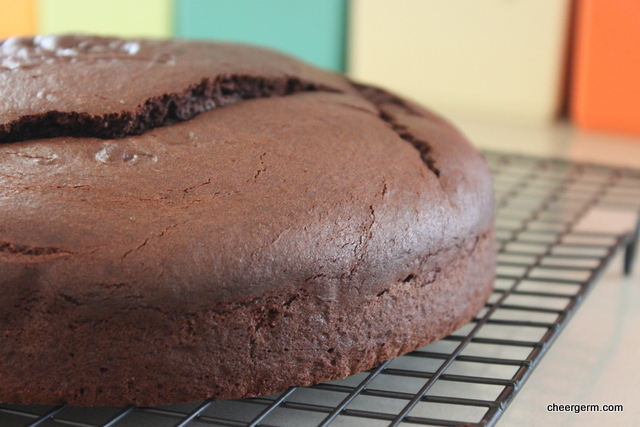 To celebrate, here is the gluten-free chocolate cake baked for the Yak’s birthday a few weeks ago. Whilst stealing someone else’s birthday cake could be seen as a cruel injustice, I am really only stealing the idea of a birthday cake. First things first. To the man who actually ate this cake, Happy Birthday Mr Yak; you totally fabulous, dry witted, old before your time in a totally ironic way, Northern English bloke. Secondly, Happy Birthday to this blog. It’s been a big ball of fun and I wish I could send all of you a piece of this light, fluffy chocolate cake action. As that is impossible, I will send you the idea of this old school chockie cake. The buttermilk gives the crumb a lovely moistness and as it’s not too rich, people usually come back for seconds. (Or thirds, hey, back off…leave some for me.) A dear friend has been making this cake for a few years and she changed it to a gluten free version when the Yak become a Coeliac. Thanks for reading folks and enjoy your cake. Preheat oven to 160C and line a 22cm non stick springform pan or grease a non-stick bundt tin. 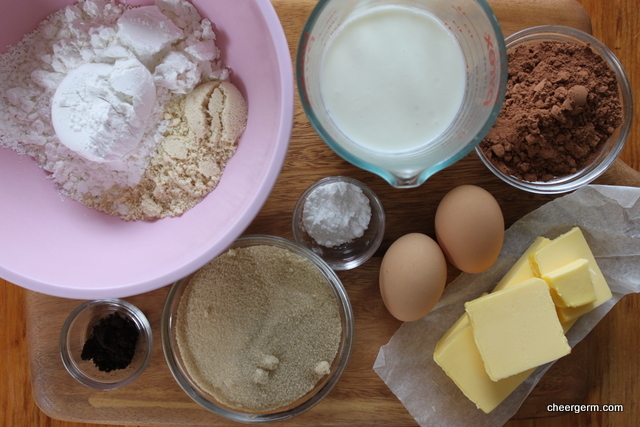 Sift flour, almond meal, cocoa, bi-carb soda, sugar and vanilla bean powder in a large bowl or a mixer bowl. Add 1/2 the buttermilk and cooled butter and beat at a medium speed until combined. 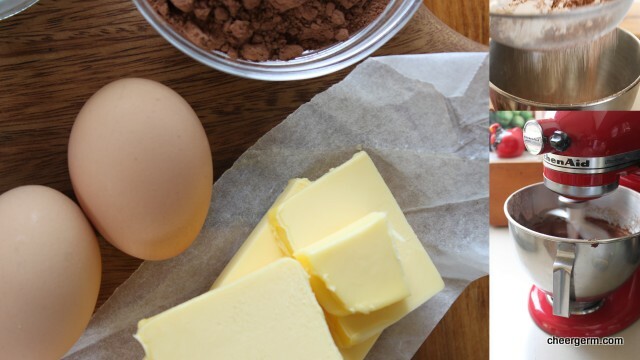 Gradually add the rest of the buttermik, egg and the rest of the butter (and vanilla essence if you are using a liquid form). 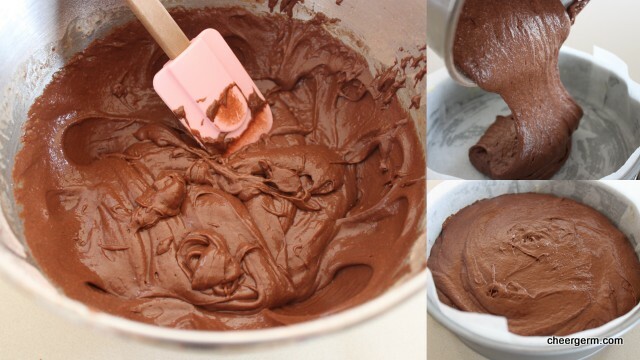 Beat on medium to high speed for around 2 minutes until the mixture is thick and creamy. Don’t overbeat! Cook for 50 minutes to one hour. Test with a skewer. Leave in in for 5 minutes then turn out and cool complete on a cooling rack. Dust with icing sugar. We ate it with strawberries and creme fraiche. This entry was posted in Gluten free baking and desserts and tagged baking, cheergerm, chocolate cake, Cooking, desserts, gluten free, gluten free chocolate cake, recipes. Bookmark the permalink. Happy birthday cheergerm and “old before your time” Northern English bloke! I’ve had a mixed week in the kitchen, one huge GF cake success, two disasters! Glad you came through for the Yak, the choccy cake looks great Cheery! I’m always happy to see a post from you land in the WP reader. You’re a natural! Happy birthday Mr Yak, happy blogging birthday Mrs Yak..
Oh Mrs Recipe. Thanks so much for the gorgeous comments. I have had a hoot and meeting great people such as yourself has been an unexpected delight and joy and actually made this blogging experience worthwhile. I have had a couple of gf muffin disappointments lately, so I hear you on that front!! We battle on in the face of adversity, ha ha. Happy birthday to Mr Silly Yak and happy birthday to Cheergerm! 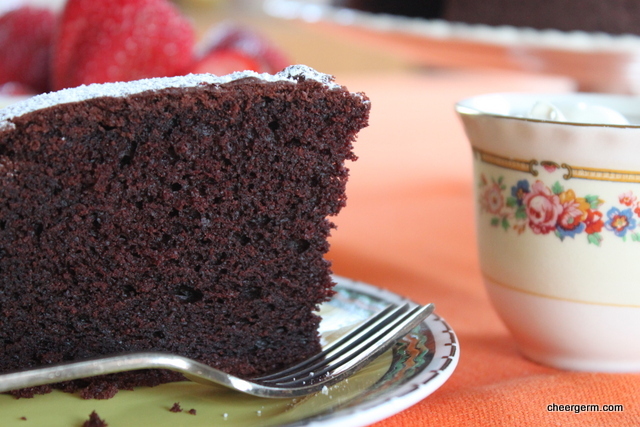 I love a good chocolate cake, the more recipes, the better 🙂 I love how moist this one looks, sure to be a favourite around here too! Drool, chocolate cake. Happy birthday. Congratulations! What a fine looking cake with which to to celebrate! Thanks so much CG! It was a super delicious cake. Happy B-day, Cheery and Mr. Yak! Looks like a fab cake, but then it is CHOCOLATE. Can’t go wrong with certain ingredients. Glad you had success making it GF. Well, congratulations firstly, Cheergerm! Happy Day. And well wishes to the Yak, who most certainly must blow out his candles and only wish that you will not leave him for another year. 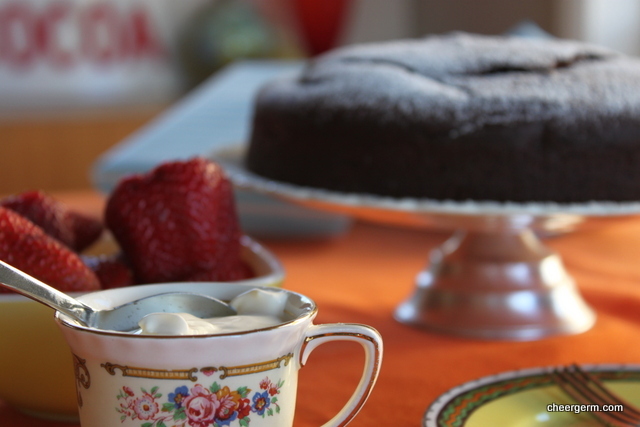 Your chocolate cake is timely as I’ve just finished a massive chocolate cake taste test–for research purposes of course. Yours looks perfectly fitting to your season, everything pairing beautifully together: strawberries, cream and chocolate. My season has no berries and since I’m steadily working on creating enough fat layers to make it through the oncoming winter, the only thing we can sensibly pair our heavy cakes with is heavy icing. I will not make waves about it–unless I’m waving down someone passing through the kitchen to cut me another slice. Thanks for the lovely wishes Mrs P! I will probably hang around a bit longer….not had any better offers yet. 😁 Chcolate cake recipe testing sounds like a very important job, you are a saint and a Trojan to sacrifice yourself to that kind of necessary scientific testing. It is also a great way to end up with ‘chocolate cake pants’. But seeing as its your cold season, who cares!! Go nuts, wear bigger pants..Yes, no berries for you northern hemisphere peeps!! Heavy icing it is….salted caramel sauce even perhaps?? Mmmmmm…. I knew only you could understand. 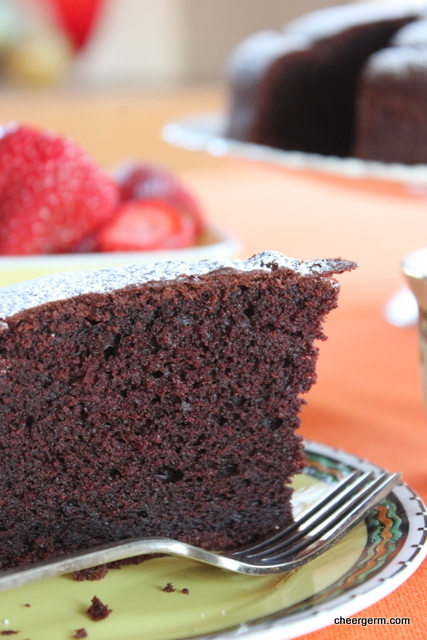 Gorgeously moist and chocolately cake! Happy Birthday! hip hip hooray! I *know* I am getting old – sometimes I hear my voice saying something that would be more suited to an elderly matron that my good self and I just cringe. Anyway, your bloody cake looks bloody amazing. Thanks Mrs Hungry! Yes, that generation gap shows itself no matter how ‘hip to the jive’ we try to stay. (Lord, how old did that sound?) Taa greatly, it was indeed, bloody tasty. These days it seems whenever I speak to my children I sound more and more like my father ‘When I was your age…’ or ‘Back in the day…’ and of course ‘I remember when…’. But they are usually too busy staring at their mobile devices to take too much notice. Ha ha Mr Stan! Which brings to mind, what the heck were we staring at when our parents were saying those very same thing? I always swore I would never say ‘When I was your age’ but sadly, those words have sneakily slid from my lips. And since I’m all about cake I must say this is some impressive stuff right here. Happy Birthday to your blog. Happy Birthday to the Yak. You are NOT old, they’re just morons, kids these days. And could you please send me a slice? How did I miss this? Congratulations to the both of you “old timers” and here’s to your delicious, visually stunning and beautifully-written blog! My blog recently turned one as well, and I am a “Smoke on the Water” fan, so we are of an age in both respects. As for the cake, looks like a winner. Anything with buttermilk, I’m in! Thanks for the good wishes LM and for your lovely words. They have made me a very happy Cheergerm. And a big congrats to you fellow ‘onesie’ (but let’s not wear onesies to celebrate, I don’t like to judge but I feel they look best on say, a one or two year old…) Love your blog, your love of food and your wonderful writing. We probably are a similar ‘real time age’ methinks, won’t divulge the exactness of that on this public forum. This cake rocks, buttermilk really is the key. Great stuff isn’t it?